PROPERTY and leisure group UDA Holdings Bhd said it is considering a plan to raise up to RM500 million by selling shares through a real estate investment trust (REIT) in two years, as it looks at ways of unlocking value from its property assets. UDA, a unit of the Minister of Finance Inc, plans to list a retail REIT in Malaysia, which would include BB Plaza in Kuala Lumpur, Greentown Mall in Ipoh and Plaza Angsana in Johor Baru, managing director Datuk Jaafar Abu Hassan said. 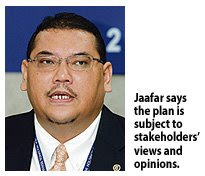 "We are considering (to raise money through) a REIT, but the plan is subject to stakeholders' views and opinions," Jaafar told Business Times yesterday. The group will undertake a detailed study before it embarks on the plan. "The REIT would need a positive income stream. We have over 12 properties, but they are not attracting enough yields. We are pushing for business. Our malls have potential to do better," Jaafar said. He added that the idea for a REIT was mooted a few years ago, but was put on the backburner as UDA grapples with low rental rates. UDA's current asset is worth over RM2 billion. Besides BB Plaza, Greentown Mall and Plaza Angsana, which have yields of up to 8 per cent, it owns Hentian Puduraya, Hentian Duta, Cahaya Suria, Pertama Complex, Sinar Kota, Plaza UO, Plaza Warisan and Tunas Utama in Kuala Lumpur and Plaza Ampangan in Seremban. UDA also owns Ancasa Hotel Kuala Lumpur, Puduraya Hotel, Ancasa Resort Allsuites (apartment) Port Dickson, Jerejak Resort & Spa in Penang, and Kuala Terengganu Golf Resort. Jaafar also said UDA will spend RM60 million over the next 6-10 months on a facelift for its malls and commercial buildings, and another RM15 million to refurbish its leisure properties. Meanwhile, the group's focus will remain on increasing Bumiputera participation in economic activities and property ownership in urban areas. "In UDA, we give rebates and opportunities to Bumiputera entrepreneurs and others to do new business. Whatever that we plan, it must yield positive results," Jaafar said. UDA is targeting RM400 million in revenue this year and to maintain its 2008 net profit. For fiscal year 2008, UDA posted a net profit of RM28.8 million on revenue of RM313.3 million. Jaafar attributed the higher revenue to its 14 on-going projects in the Klang Valley, Penang, Johor and Pahang, worth a combined RM900 million. "We will launch more projects this year. The business has to move despite the turmoil," Jaafar said. KUALA LUMPUR: UEM Land Bhd’s share price had its biggest one-day gains this week on July 3 after the company said it was in talks with potential investors for its Puteri Harbour project in Nusajaya, Johor. It closed eight sen higher at RM1.46. It was actively traded with 28.31 million shares done. The share price had fallen 26 sen from June 30 to July 2. On July 1, UEM Land Bhd is optimistic of securing partners for its Puteri Harbour project by year end after Dubai’s Damac Properties pulled out of RM396.4 million land deal. UEM Land managing director and chief executive officer Wan Abdullah Wan Ibrahim had said the company was in “talks with four to five potential partners including locals and from Australia and Singapore” for the project. SUBANG: Hospitality player Dorsett International Sdn Bhd aims to add 10 hotels to its existing chain of five hotels and resorts in Malaysia in five years, says president Eddie Tang. He said the parent company had allocated RM500mil for the expansion. Dorsett International, set up at the end of last year, is the Malaysian hospitality arm of Hong Kong-listed Far East Consortium International Ltd, which is mainly engaged in property development and hotel operations in China. Dorsett International now owns five hotels – the five-star Sheraton Subang Hotel & Towers, the international class Grand Dorsett Labuan Hotel, the four-star Dorsett Regency Hotel in Kuala Lumpur, the four-star Maytower Hotel & Serviced Residences in Kuala Lumpur and the three-star Dorsett Johor Hotel in Johor Baru. “Currently, we have five hotel projects in the pipeline under our five-year expansion plan,” Tang told StarBiz in an interview. He noted that of those five projects, two in Kuala Lumpur were in the building design stage while the other three were under negotiations for the purchase of land and building. “We are looking to set up a boutique hotel in Sri Hartamas, a Dorsett Hotel in Cheras, Dorsett Hotel & Resorts in Kota Kinabalu, a Grand Dorsett Hotel in Penang and a hotel and a resort in Kuantan or Kelantan,” he added. Tang, formerly the chief financial officer of Malaysian Land Properties Sdn Bhd, was appointed president of Dorsett International in early January to oversee the management of the company’s five hotels in Malaysia. He said Dorsett International was undertaking a rebranding exercise to consolidate its operations. The company has four brands in Malaysia – Grand Dorsett, Dorsett Regency (business and leisure hotel), Dorsett Hotel (mid-range hotel) and Maytower Hotel & Serviced Residences (a combination of hotel and serviced residences). “Under the rebranding exercise, the 502-room Sheraton Subang Hotel & Towers will be changed to a new name in October after the handover of operations effective Oct 1,” Tang said. “By end-2010, customers will be able to identify and relate to the group’s various classes of hospitality services – international, mid-range and serviced residences,” he said. Far East Consortium acquired Sheraton Subang Hotel & Towers from Starwood Hotels and Resorts Worldwide three years ago but the hotel had remained under the management of Starwood. Tang said the renovation and refurbishment of Sheraton Subang had started and would cost RM60mil. “Our hotel rooms, reception and lobby lounge will have a totally fresh look,” he said. However, Tang said, the rebranding would try to move away from the star-ratings system practised by Dorsett International’s sister hotels in Hong Kong. “In Hong Kong, a lot of hotels are breaking away from the star ratings,” he noted. According to Tang, hotels rated four stars and below have been spared the full impact of the global economic slowdown as people cut down on lodging expenses and downgraded their accomodation needs. “In the first three months of this year, Sheraton Subang was quite badly hit too. However, we expect demand to pick up again. “I see the global economy coming back, given the high occupancy rates in our hotels now,” he said. Currently, Sheraton Subang has a 70% occupancy rate while the Dorsett Regency has 80%, Grand Dorsett Labuan 85%, Dorsett Johor Hotel 60% and Maytower Hotel & Serviced Residences 60%. The company would upgrade the MICE facilities in Sheraton Subang next year under the second phase of refurbishment, he added. According to Tang, Dorsett International will also look at expanding its outside catering business. He said Dorsett Regency had been running the outside catering business for three years now, while Dorsett Johor Hotel had just begun in mid-June. Sheraton Subang used to do it under the management of Starwood. “The response has been good so far and we will emphasise more on outside catering in the future,” he said. For the financial year ended March 31 (FY09), Dorsett International posted a revenue of RM112mil. Based on its current occupancy rates, the company expected revenue of RM125mil in this financial year, Tang said. The hotel operator forecasts a revenue of RM143mil in FY11 as more hotels are rolled out and as it reaps the benefits of its rebranding exercise. PETALING JAYA: Putrajaya Perdana Bhd unit Putra Perdana Construction Sdn Bhd has been awarded a RM287.23mil contract for the main building works of Naza TTDI Sdn Bhd’s 50-storey headquarters. In a statement to Bursa Malaysia yesterday, it said the project would take 33 months and was expected to be completed by March 31, 2012. The project was expected to contribute positively to the group’s earnings and net assets for the financial years ending Dec 31, 2009 to 2012, it said.